Planet Coaster is a game that respects its roots in the genre, and then innovates on those that came before it. Planet coaster is a game that respects its roots in the genre, and then innovates on those that came before it. Whether you’re a fan of no limits, sandbox play, or the more traditional career approach, Planet Coaster has something to offer. The team at Frontier has spent equal time developing both aspects, and the result is a game that truly feels like a complete package, somewhat of a rarity in the current gaming climate. It is apparent in the attention to detail that the Frontier team put their heart and soul into this game, and it paid off. 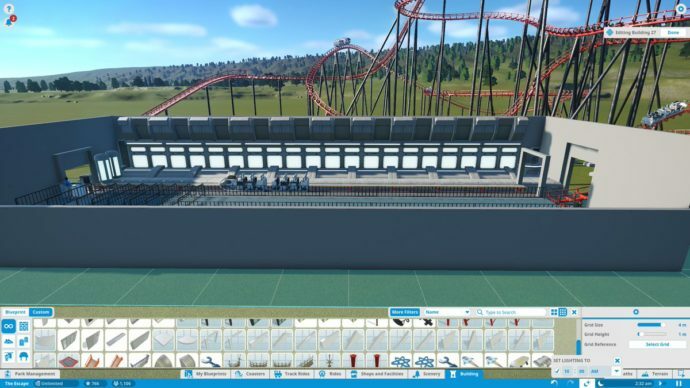 The base gameplay of any theme park simulator is ride building, and Planet Coaster makes that easy to do by implementing a coaster design system that allows for complexity, but not at the cost of usability. With full 360-degree rotation of track pieces, over 20 coaster types, and a plethora of flat rides, Planet Coaster makes it possible to create tons of unique parks, each with their own feel. The building system does not take very long to master, and offers more options to advanced players, while not overwhelming those who are new. Each coaster type also feels unique, with the team faithfully recreating realistic coaster aesthetics, right down to the type of support beams used. Even the sounds a wooden coaster makes as it careens around its track sound real. It’s these little details that help make the game feel immersive, and evoke nostalgia that will no doubt bring players back to recreate their favorite rides for years to come. For example, the classic steam train is made of modular moving parts, making watching it chug across a park addicting to watch. In a game with a massive feature set, it is nice to see so much polish, even on the little things. However, building coasters would not be as fun if there were not people to ride them. Frontier has once again delivered by creating park guests (peeps) that have thought patterns that mimic real theme park goers, and a realistic drive system. In one of their development videos, Frontier described the guest brain. When a guest steps into the park, they have an objective in mind, a specific ride they want to visit, or a set of activities they want to carry out. Whether they complete this activity can be influenced by the layout of a park, as well as what else is present to potentially distract them. Combining all these factors will influence their happiness rating, and can make for an interesting challenge when trying to make the best theme park possible. Seeing the excited looks on their CGI faces really makes it all worth it… right? One of my favorite innovations related to the guest brain is how they interact with ride queues. Guests may still queue up in a boring line with no scenery around it, but they will be much happier to do so if the queue area is themed. This is where Planet Coaster’s many scenery objects come into play. At launch, there are five themes for scenery: Western, Sci-fi, Fantasy, Pirate, and the generic Planet Coaster Theme. Each of these themes has a unique set of modular building pieces to create large sets, as well as animatronics, foliage, and stationary props. The aim is to provide players with enough pieces so that they can build whatever they want in game, and some already have. 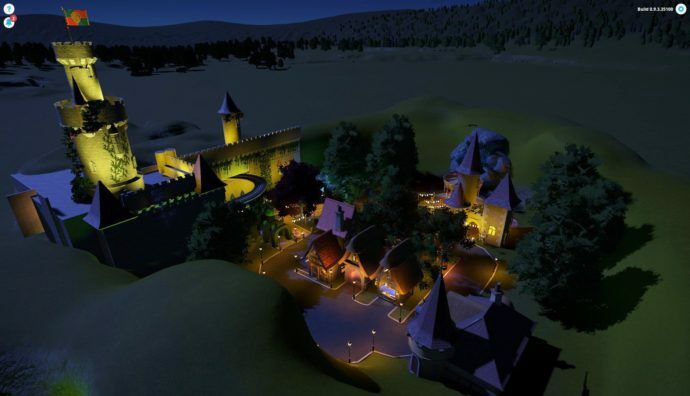 Players from around the world have already come together to make some amazing creations using Planet Coaster’s modular building system. Whether it’s a theme park filled with Japanese pagodas, or a set of buildings to bring guests back to the roaring twenties, the community is on it. What makes this especially great is how easy it is to share these creations on the Steam Workshop. 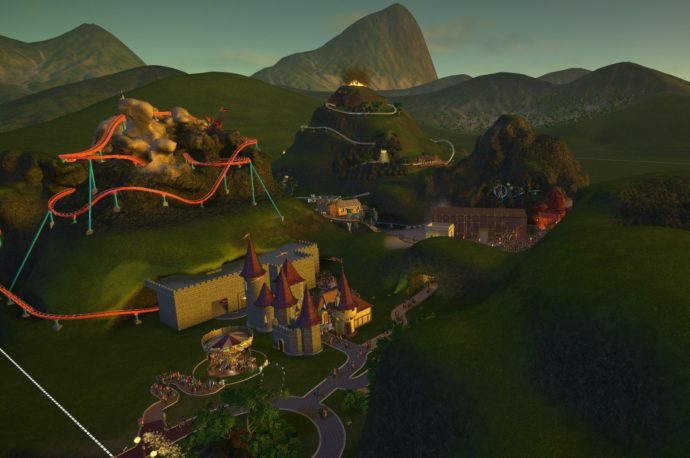 There is a button in game to save designs, and then through the in-game UI, players can upload parks, scenery objects, buildings, and coasters to the workshop. It makes it easy to experience other player’s creations, as well as share your own. An image of my log ride that is currently on the Steam Workshop. Through the downloading of other players’ materials, as well as the built-in set pieces in Planet Coaster, the only limit is the player’s imagination. It’s a common occurrence for me to pop into the game with the intent of building a large coaster, and then spend over an hour theming a toilet stall to make it fit with the rest of the scenery aesthetic. The sheer number of props, animatronics, and special effects is mind-blowing, and to top it off, a lot of them have been implemented in Planet Coaster’s innovative trigger system. The trigger system allows players to set certain animatronics, lights, and special effects, to only operate when a ride passes over a certain portion of track. This makes setting up large climactic scenes (kraken attacks, exploding wild-west shootouts, and space battles) incredibly easy, and provides the opportunity to create some very complex rides. Each trigger can have multiple items attached to it, and each item can be set on a timer. Setting these systems up is easy (provided you don’t place too many props in one place), and increases excitement ratings of rides for guests. Yes, all of the fire in this picture is on triggers and it took forever. 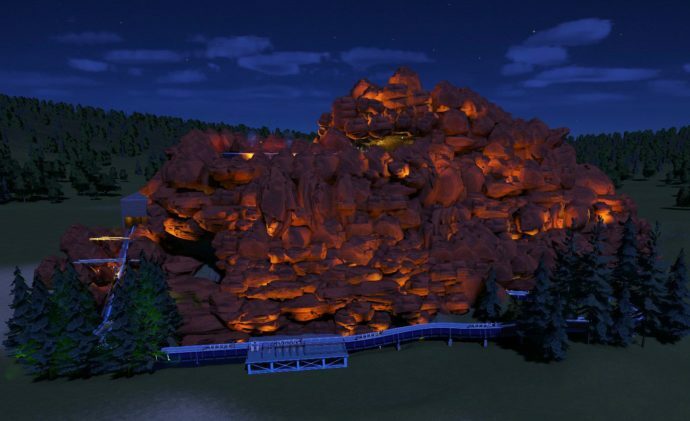 I would also be remiss if I did not mention Planet Coaster’s terrain system. Creating caves, mountains, and lakes has never been easier. 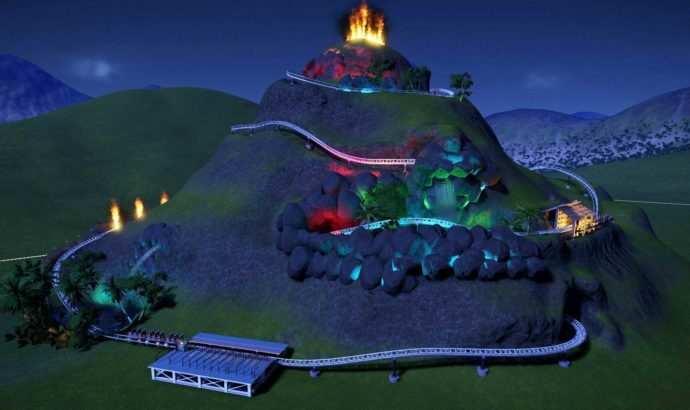 Coasters will automatically tunnel through terrain, and the player can also easily form terrain around them. While the system is very easy to use and allows for a lot of creative option, it is also home to two of Planet Coaster’s only problems. The first, is the water system. Lakes might be easy to create, but feel very static in comparison to the water system in past games like Rollercoaster Tycoon 3 (which was also not great). The second is that terrain can only be painted with types that fit within the biome the player picked as their park’s location. Developers have explained that this is due to a limitation in the game’s engine, but all the same, it’s a little disappointing. Overall, despite these facts, the terrain system is still very easy to use, and makes for some cool scenery. It took forever to build, but damn it’s pretty. 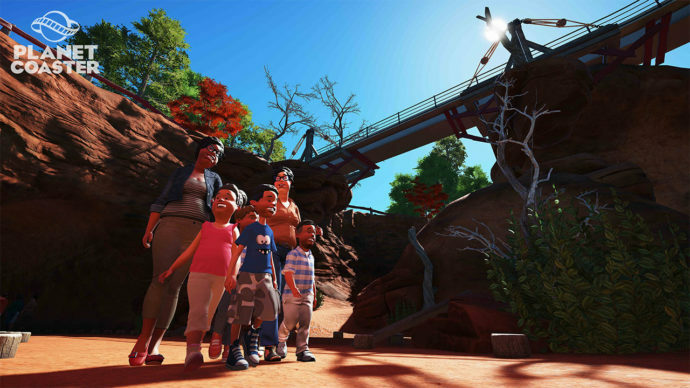 All these different features are put to the test in Planet Coaster’s career mode, which puts players in charge of park scenarios with varying levels of difficulty. Some levels, like the Monolith scenario present special challenges, like making rides break down more often than normal, while others, allow the player to simply test their park building skills on a budget. While none of the scenarios feel incredibly difficult to complete, the game does not feel lacking. Frontier did not set out to make a challenging coaster game, they set out to create a place where players could escape and create their wildest theme park fantasies to share with others. Planet Coaster succeeds on so many levels that it feels difficult to review it. I have been playing since the game’s Alpha in late August, and have not yet gotten bored with the gameplay. With the implementation of the Steam Workshop, and the DLC that is sure to come down the line, Planet Coaster is going to be a mainstay for the tycoon genre. It is the sequel to Rollercoaster Tycoon 3 that fans have been so desperate for, and blows all its competitors out of the water. For anyone who enjoys theme parks, or just likes to create, this game is an absolute must buy. Aside from a few minor missteps, Planet Coaster is the coaster simulator fans have been waiting for. Ashton lives in the Ewok village that is Redmond Washington, enjoys gaming, writing, and a good pug.